For a restaurant or other food service operations, there’s nothing more important than keeping the refrigeration unit tidy, clean and well maintained. After all, the refrigerator is the heart and soul of any food-based business. – First, the food must be rotated and culled on a frequent basis so that only the freshest food is served to customers. – Secondly, food must be properly stored in appropriately labeled containers and separated according to health code regulations so that cooked and raw foods are not in contact with each other. – Next, the shelves, drawers and bins must be kept clean so that harmful bacteria don’t begin to grow and foul odors are kept at bay. – Mechanical elements such as the door gaskets and coils need to be cleaned and maintained regularly to keep the unit in good working order and the temperature at proper levels. – The exterior surface needs to be wiped cleaned frequently to avoid cross-contamination of germs as many different users touch the handle to gain access to the food inside. Regular cleaning. After every shift, take a moment to give the refrigerator’s exterior surface a regular wipe down. This simple action can do wonders to help maintain its appearance and keep the built-up grime, dirt and messy fingerprints to a minimum. Using a non-toxic cleaner and a fresh, soft dishtowel designated for cleaning, wipe the exterior from top to bottom. 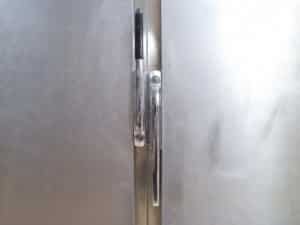 Pay special attention to the refrigerator handle that may be harboring harmful germs. Make sure to use a cleaner specifically formulated for refrigerator use as these cleaners should be free from ammonia, acids, dyes, butyl, harsh caustics and fragrances that can impact the quality and freshness of food. By cleaning the surface frequently, you’ll give yourself some real peace of mind that none of the nasty deposits are being transferred from food to the refrigerator and then back to food again. If your company doesn’t prepare food, but maintains a refrigerator in a break room setting, post a sign that reminds employees to take care of any messes in the refrigerator promptly. While break room refrigerators are typically used to store just lunches and beverages, sometimes liquids and soups can leak or spill and if not addressed quickly can create odor and grime. Take it up a notch. In addition to daily cleanings, schedule weekly deep-cleaning sessions with a heavy-duty professional cleaning agent. As you either empty food into another refrigerator or stack it into large coolers filled with ice, throw away any outdated or spoiled food. Then, since the refrigerator is an electrical unit, unplug it before beginning to clean. Next, working from top to bottom, use a general non-toxic cleaner to wipe all surfaces clean. Move on to scrub the shelves, removing them if necessary to give them a good soak and rinse completely. If the refrigerator has any drawers, remove them, soak, clean and then rinse completely. Air dry before returning to the refrigerator. Take the next step. Cleaning the interior is great, but for proper maintenance and temperature control, you must also give special attention to the door gaskets, seals that can harbor mold, the condenser coil and the fan. Door gaskets are fairly easy to clean. Just soak them in a simple solution of soap and water, wipe clean, dry and re-attach. Check the sealing action after re-attachment. The condenser coil needs to be kept free of dust and lint so it needs to be cleaned with professional cleaner that will address these issues. Look for a water-based coil cleaner that sprays a heavy-duty foam that will clings to the coil surface and then break down for maximum cleaning power without worries of clogging the coils. Carefully clean fan blades with a fresh, soft cloth. This entry was posted in Food Service and tagged All Purpose Cleaner Concentrate, coil cleaner, kitchen, organic, refrigerator. Bookmark the permalink.